This is the figure of a warrior, dressed in a robe and wearing a helmet. His features are impassive, his eyes and mouth mere holes pierced in the clay. His baggy trousers are fastened tightly below the knees by a cord, while gauntlets and a dagger are tucked into his belt. The painstaking attention to detail indicates the figure of a noble warrior, and the style of dress suggests that he came from the northern region of Kanto. 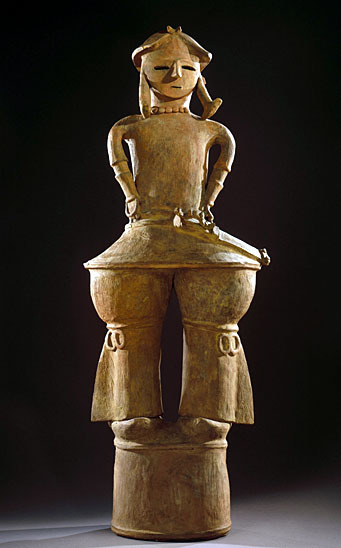 Standing, perched on a cylinder -in fact a haniwa or “clay cylinder”- strikingly realistic figures of men, priestesses and animals were represented in this way, along with images of shields, houses, offering bowls or simple tubular haniwa. The extremely wide variety of facial appearances, costumes and expressions found on these figures reflects a well-established social hierarchy. All the figures were made from coils of clay and fashioned by means of spatulas. At this period, the haniwa were placed in a circle around the burial mound kofun and in trapezium form around the front of the tomb. The figures representing humans and animals were placed to the fore to ward off profanity and evil. Moreover, they symbolically celebrated the ceremony of transfer of spiritual power from one sovereign to the next. As witnesses to and actors in the ceremony, they attest to the fact that it was carried out at the very site, and confer upon it an eternal quality. From the late 3rd century CE, large burial mound tombs were built throughout Japan, showing that society was organized into clearly distinguished social classes, led by local chiefs for whom such tombs were reserved. The arrival of Buddhism introduced new modes of burial and led to the disappearance of haniwa.